These ADA walk showers are the perfect models for commercial projects that need to meet ADA specifications and ADAAG Guidelines, Freedom ADA shower enclosures have a low, barrier free threshold with a maximum ½” beveled threshold for compliance. Handicapped Accessible ADA showers are a must-have for public buildings. ADA compliance provides mobility disabled individuals full access to a shower, allowing them to bathe safely and independently. Every ADA Transfer Shower comes with either a seat side receiver flange, or the option to add a Z strip or receiver flange to meet the most current ADA codes. 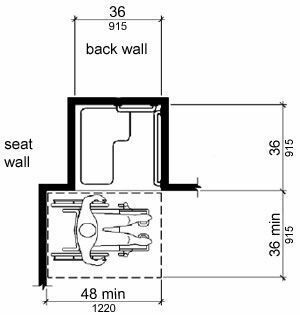 The following diagram illustrates the 48" clear floor space required for transfering from a wheelchair to a shower seat. ADA transfer showers should be ordered with a recessed receiver flange on the seat side to accommodate a parallel wall. Our line of ADA compliant shower enclosures offer a selection of one-piece showers for new construction, or multi-piece units for remodeling projects. Simplify and meet all ADA requirements for your project by ordering your transfer showers complete with all accessories, including a folding shower seat, grab bars, curtain rod and more. Factory installed accessories combined with a prelevelled base and easy to install pin & slot wall system, make for an efficient and cost saving installation. Freedom ADA compliant showers come with full reinforced backing and a 30 year manufacturer’s warranty. If you are a commercial or public building operator planning for current or future accessibility needs, call our expert customer service team. They are standing by to answer your questions and help you choose from our high-quality, customizable options in Transfer Shower Stalls for ADA compliant bathrooms.